Dev Anand and Hemant Kumar together created some of the most memorable songs of Hindi film music. Interestingly, Hemant Kumar sang only 11 songs as playback for Dada Burman and 10 of those were on Dev Anand and all of them were hits! What a stupendous record! A stroll down their massive all-time hits that continue to mesmerise music and cine buffs. 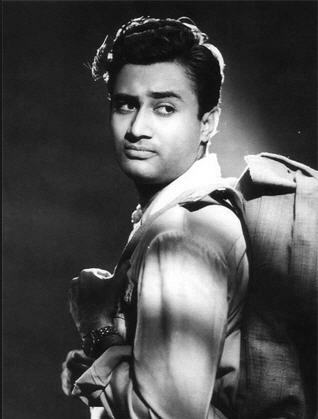 The evergreen hero Dev Anand would have celebrated his 93rd birthday on 26th September this year. Yet, this again is the day when in 1989 Hemant Kumar left this world. The connection is much deeper than just the date. Dev Anand and Hemant Kumar together created some of the most memorable songs of Hindi film music. Prior to Dev’s partnering with Kishore Kumar or Rafi as his playback voices,the super hit combination of Dev with Hemant Kumar were belting out hits consistently. When I pointed out Sachin Dev Burman was using so many voices on Dev Anand simultaneously such as Kishore, Talat, Rafi and Manna Dey alongside with your voice, Hemant Da replied, “But the real and most romantic ones belonged to me. Just like in Bengal my voice was the romantic voice of Uttam Kumar, in Bombay it was my voice when Dev Anand romanced.” Well, Hemant Kumar sang only 11 songs as playback for Dada Burman and 10 of those were on Dev Anand and all of them were hits! What a stupendous record! Who can forget the start the duo had in Sazaa (1951) with Aa Gup chhup gup chhup pyar karen and then the massive hit next year in Jaal, Yeh raat yeh chandani phir kahan, sun jaa dil ki dastan. The smartly-attired Dev Anand, strumming his guitar in the wind-blown beach hut sings the most evocative romantic song that would set any heart aflutter. No surprise then, his lady love Geeta Bali found it impossible to ignore the beckoning. Who could, anyway! At one time in the history of Hindi films, ‘Yeh raat yeh chandini phir kahan’ was hailed as ’the most romantic song of impulse ever’. Whether you talk of the scene on screen or just the audio – the impact was tremendous, of equal strength. SD Burman used a masterstroke of an innovation in this song – making Hemant Kumar repeat the first line of the antara, but going only half way. You need to have absolute mastery over your medium to attempt this. What an impact that song has more than six decades since its making is evident in the nearly 14 million views on YouTube. Not only was the music, the lyrics, the singing that left that impact, it was also the performance of the lead artists (Dev and Geeta Bali), the direction by Guru Dutt and extremely polished and reverberating cinematography by V K Murthy that all contributed in their might. Dev Saab, no one can take these memories away from us. Hai apna dil to awara had topped the ’58 Binaca Geetmala charts, after staying there for almost a year. Going against director Raj Khosla’s wishes to sing it himself, SD Burman got Hemant Kumar to croon for the swashbuckling Dev Anand. Burman Dada’s choice of singers was unquestioned, he had the uncanny knack of picking the right voice for the right situation… spot on! Hai apna dil to aawara was a chartbuster song by Hemant Kumar picturised on a train as an amused Dev Anand watches a scowling Waheeda Rehman and her beau eloping. We have had songs on trains… and many a time it is our Dev Saab doing the honours – Apni to har aah ik toofan hai or Jiya ho, kuch bol do or Phoolon ke rang se… there are several such “train song” situations built around the one and only city-slick evergreen hero. But this song in Solva Saal cuts the cake differently. You have a bemused Dev Anand singing supposedly to himself with comedian Sunder giving sangat on the mouth organ. But Dev Anand’s eyes never leave Waheeda Rehman who is quite obviously not in the happiest frame of mind. It’s not a love song being sung to a beloved yet it oozes romance in every word. The romance is about life, about celebrating its freedom, about indulging the carefree heart. Who can express love, life and poetry this way but Majrooh Sultanpuri Sahab! And Hemant da’s deep voice releases a rare resonance, a unique sweetness. 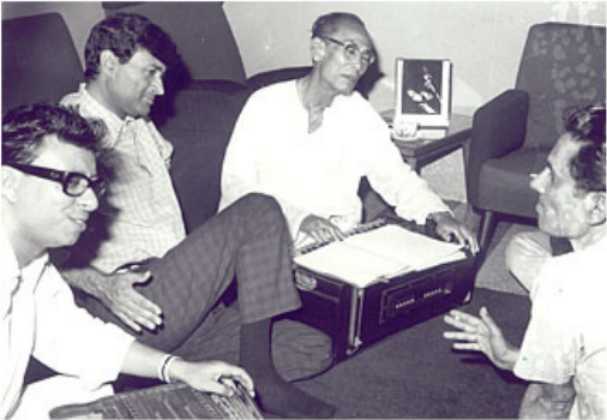 RD Burman, Majrooh Sultanpuri and SD Burman. Dada Burman created the space for the harmonica in Hai apna dil to awara as a special gift to showcase son, RD’s excellence at the mouth organ. And there is just a wee bit of cynicism and pain thrown in, cloaked behind those mischievous smiles that Dev Anand throws at Waheeda Rehman who is all fire and brimstone but only through her eyes. If looks could scorch, Dev Anand would have needed tubes of Burnol! And so we have one of the most ‘innocently flirtatious’ (please excuse the oxymoron) songs that caught the pulse of the youth, complete with a harmonica (by who else but Pancham da), a rapid clap-trap and of course the yah-ha-ha-ha… try humming the song without this musical guffaw. You can’t. “When ‘baba’ (singer Hemant Kumar) returned from the recording, I’d asked how the song was and he’d shrugged, ‘Theek chilo’ (It was okay),” Hemant da’s son Jayanta Mukherjee had said in an interview to Hindustan Times. Oh well, if this was “theek chhilo”, then what was “bhalo chhilo” by Hemant Da’s standards? Hemant Da had emphasised that theirs’ (Dev Anand and him) was the most hit combination that he as a singer had with any hero in Hindi films. Other memorable hit songs came in with House No. 44 (1955) – Chup hai dharti chup hain chand sitare and Teri duniya mein jeene se to behtar hai ke mar jayen. Hemant Da had explained, “Many a times, while singing or rehearsing, I would wonder why he (Sachin Dev Burman) chose me to sing this one or that one, in House Number 44, Chup hai dharti chup hain chand sitare, I thought was a Talat song. Similarly, Yaad aa gai wo nashili nigahen in Manzil, could have been a Kishore song. But, only he knew the best. And when I listen to the songs now, I think his judgement was the best. He was a unique music composer of our times. How to use a voice to its best output and effect was his uniqueness. All these songs, I have to sing them in all my public performances, it is public demand. Also, all my LP records issued by HMV have these songs to enable them register good sales. And the other evocative number from House No. 44 was the pathos-laden song that expressed the anguish of a lost soul ruing the absence of love in his life in the most heart-wrenching words. Teri duniya mein jeene se to behtar hai ke mar jayen. Sahir’s words and SD Burman’s music ensured the audience was carried away into the world of the defeated lover who finds himself surrounded by unknown faces, closed doors and finds no purpose in living anymore. House No. 44 also has the fun duet Peechhe peechhe aakar in which Hemant only sings a supportive ho-ho, ha-ha to to Lata. In Manzil, SD Burman had three singers (Manna Dey, Hemant Kumar and Mohd Rafi) giving playback for one hero. And the singers were picked on the basis of the mood and situation that would sync perfectly with that particular voice. For Yaad aa gayi woh nasheeli nigaahein, Dada Burman picked only Hemant Kumar and no one else. The unique, once in Hindi film history, marriage song for Lord Shiva came in Munimji (1955), Shiv ji bihane chale paalki sajaye ke babhuti lagaye ke, naa. Each one brings pleasant lively memories and melodies back to our mind. Eventually, SD Burman decided on two masti-bhare numbers for Hemant Kumar on Dev Anand – Dil ki umangen hain jawan and Shivji bihaane chale – proving that the sombre and deep Hemant Da can be just as fun and peppy as the situation demanded. And what a perfect selection it was, as always! One of the biggest hits of Dev Anand-Hemant Kumar, the mesmerizing Na tum humein jaano, was the last of their songs together. Haunting and romantic, this duet with Suman Kalyanpur had the audiences falling in love with the number over and over again. The beauty of this composition is that the flow of voice, orchestration and instruments and the lyrics is so smooth that it almost melts in your ears like honey. Though the movie was not as successful at the box office, this song gained immortality. Na tum hamein jano (Baat Ek Raat Ki, 1962) S D Burman / Majrooh Sultanpuri. With nearly 3.5 million views on YouTube, this song proves the timelessness of the music and the cast too. 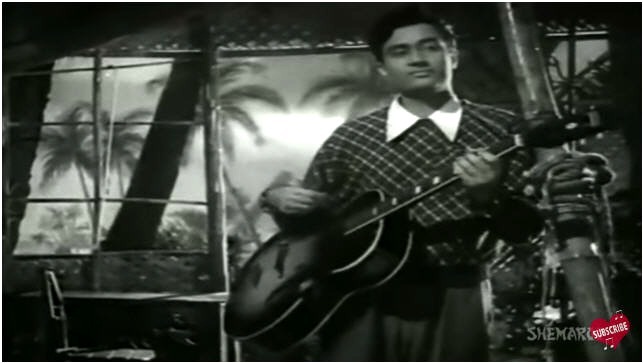 The only film that Hemant Kumar as a music director scored that had Dev as a hero was Ferry (1954) with Geeta Bali, and Dev lip-synced Rangeeli rangeeli rani nindiya aa more raja ki ankhiyon mein aa. This was a half song in the film and no disc was issued. Also, just for record, Director/Producer Hemen Gupta’s daughter Bula and Hemant Kumar’s son Ritesh (Jayant), both acted as kids in this film. 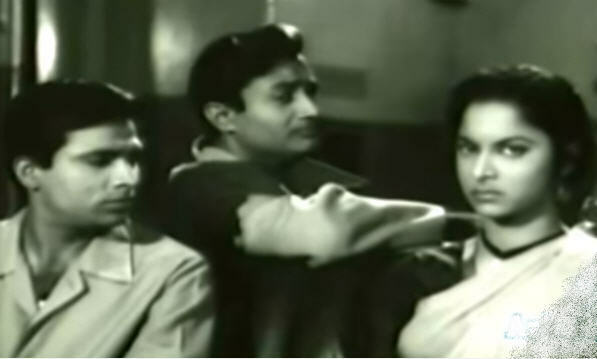 Bula later acted in her real name Archana as a heroine in Hrishikesh Mukherjee’s Buddha Mil Gaya. There are other songs that come to memory such as Yeh zindagi hai ek safar (a background song) and Zulam dhaale tu sitam dhaale in Raahi, written by Prem Dhawan and composed by Anil Biswas. But none of these were on Dev Anand. The evocative tandem Kaise koi jeeye in Baadbaan was picturised on Ashok Kumar and not Dev Anand. There were several other such songs by Hemant Kumar in Dev Anand’s films which did not feature Dev. And as a fitting finale to this musical journey with the two giants of Hindi film music, lets revisit the exquisitely delicate Hemant-Lata duet from Amiya Chakraborty’s Patita (1953), a Shankar Jaikishan classic. With more than 12.5 million views on YouTube, this is easily one of the most popular romantic duets ever. The long-shirt and dhoti clad bespectacled Hemant Da and the suave style icon Dev Anand – as different as chalk and cheese in their attire. And yet when they got together, they created gems that continue to sparkle even decades after their creators are gone. 9. Na tum humein jano (Baat Ek Raat Ki, 1962) S D Burman / Majrooh Sultanpuri. Hemant-Lata – In this song, Hemant Kumar just lends a supportive ho-ho, ha-ha to Lata and hence we have not included above. 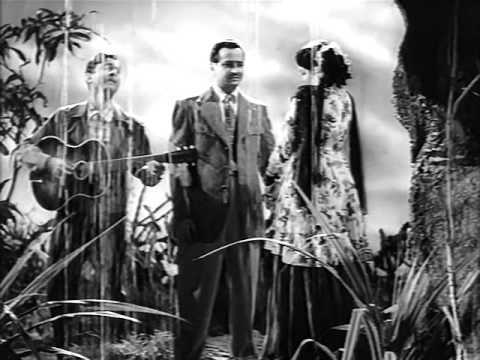 Hemant-Lata – In this song, Hemant’s Yeh raat yeh chaandni is used in the interlude as a part of the song by Lata and hence we have not included above. Excellent article. 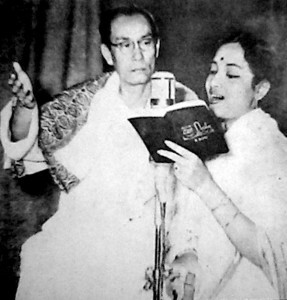 Hemantda sang just 11 songs for Burmanda. Every one of them was a hit.And except one all were for Dev Anand. I am also reminded of a Doordarshan interview of Hemant by a young lady a long time back. During the interview Hemant himself started to say,”That song in Jaal which I sang for Dev…” and she interrupted in surprise “You sang for Dev Anand also?” Hemant looked so disgusted he broke off the subject and allowed her to continue with her prepared questions. Thank you so much Bharat ji for appreciating the article. Hemant Da’s songs for Dev Anand are iconic. But as the incident you highlighted proves – like any other celebrity he too found himself at the receiving end of silly questions from uniformed reporters. It is a pain sitting through such interviews. In my years in the media, I have seen innumerable such instances of irrelevant questions at press conferences that visibly irk the person who has to patiently handle them. Its embarrassing for the others present. I had a great time putting these songs together with Peeyush ji for this article and delving into their finer nuances. Your feedback makes it all the more worthwhile for me. In fact, to me Hemant Da’s songs sit on Dev Anand more aptly than other singers including Mohd Rafi or Kishore Da. 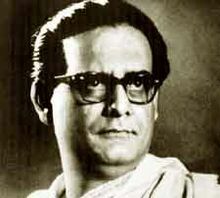 Hemant Da’s voice oozes a soft, lyrical romance which was the hallmark of Dev Saab. Vow, I couldn’t say that. For me Rafi and Kishore along with Hemant have all gelled so very well with Dev and his personality. Yes I remember that scene in the film. Probably, Raj Khosla was upset that he was not allowed to sing by SDB. But it was true tongue in cheek. Any number of reporters and interviews we have seen that are irritating as the interviewer has no knowledge. Sad. But true. In Jaal also Guru Dutt was for Raj Khosla to sing ‘Yeh raat yeh chandni‘. SDB took his test and declared that his voice will not do. It’s said that Guru Dutt was disappointed as he wanted Raj Khosla to sing. Great to hear from you about dad (Raj Khosla ). I would love to get some feedback of old times. Would love to have a copy of this Silhouette Magazine. Where is the 10th SDB-Dev-Hemant song in this list? Or – are you taking the two versions of ‘Yad aa gaeeN wo nasheelee nigaaheiN’ as TWO SONGS? Thank you for your valuable comment Ramnik ji. Your comment made us realize that other readers may also miss the 10th song which Hemant Kumar sang for Dev Anand under Burman Dada’s music. Thus we have updated the article with the 10th song – which is actually a supportive ho-ho, ha-ha to Lata’s Peechhe peechhe aakar in House No. 44. Hemant does not sing any words here. Hence, we had not added it in the article. Please do revisit the article to check the list given at the end of the article. We are very happy you read the article so thoroughly. 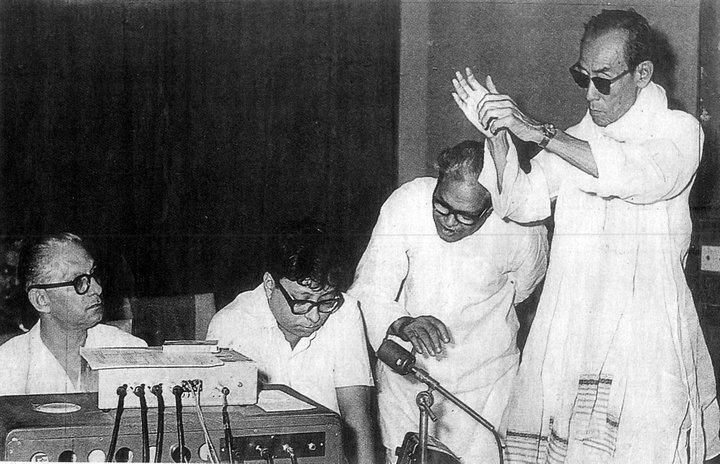 By the way, if we talk about just Hemant Kumar singing for SD Burman, then we need to add one more song. Allow me to quote from Incomparable Sachin Dev Burman, by HQ Chowdhury, which we republished recently. The songs of Rajkumarer Nirbashan were released from Columbia Records.